A cool premise here and a pretty decent start ends up becoming just an average film with the longer it goes on. 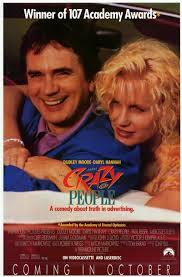 Crazy People is a light-hearted movie with a pretty creative, yet simple premise. The idea here is that an advertising executive suddenly starts telling the truth in his ads, calling things out for what they really are, and appealing to the public because of his honesty. They absolutely love his new approach, and soon this man, emory, is in high demand by the agency. The problem is he is in a mental institution. The movie might have this great premise and some really funny ads, but the longer is goes on, the more conventional it becomes. By the end of the movie we’ve got villains and corruption and all kinds of things that make it feel like every other movie out there. We get a very fun premise here, and it’s an enjoyable movie, but it definitely starts to lose its way by the end. Crazy People are a movie with a fun concept. 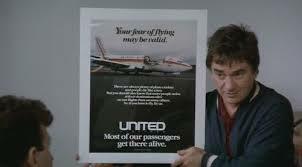 The idea is that there are these two guys working in advertising, Emory (Dudley Moore) and Stephen (Paul Reiser), and one of them starts making adds that tell things the way they really are. Basically, in a moment that is part network and part Jerry McGuire, he realizes that he should stop lying to people and call things out in the most honest way he can. That means saying things that nobody would ever dare to say, and seeing how the public responds. Emory drops these add on the desk of Stephen and then gets him checked into a mental hospital. Stephen is convinced that his buddy has lost it, and so he insists that Emory go to the hospital to regain his composure and sense of rationality. Before checking in, Emory was making adds like one for a type of car that is “too small to get laid in, but you get laid the minute you step out.” another car add, this one for jaguar, says, “for men who’d like hand jobs from women they hardly know.” and then another one for an airline tells people that their fear of flying may be valid, but most passengers do get there safely. The problem is that Stephen was in a hurry, after bringing his friend Emory to the mental hospital, and he had to get a bunch of ads printed quickly. So he told his assistant to grab them off his desk and run them upstairs to be printed. And wouldn’t you know it, the assistant accidentally grabs Emory’s ads by mistake. Those are the ones that get published, and plastered onto giant billboard, and the public loves it. They eat every word up and can’t get enough. Suddenly the products are selling and doing tremendous business and Emory’s ads are to thank for this success. J.T. Walsh plays Drucker, the boss of the ad agency, and when these ads cause a sensation, he tells Stephen to get Emory back into the office. Only Emory’s not coming back. He’s enjoying his time at the institution and refuses to leave until his treatment is through. That makes Stephen and Drucker come visit Emory in the hospital and see that there is actually the potential there for using these patients to help with advertising campaigns. Emory convinces them that he can make the ads while he is in the hospital and that he can do it with the help of the mental patients. It makes sense, because the ads are really just saying things bluntly without any sugarcoating or holding back. So drucker agrees and Emory stays at the institution to work on ads with the other patients. This is the basic premise of the movie, and it’s a good one. There is definitely a strong setup here. The problem is with where the movie goes after that. Emory finds a love interest at the hospital and slowly this movie with the great, unique initial idea starts to become more and more generic. Darryl Hannah plays the love interest and it’s not really clear what she’s doing at the hospital. She has a brother who was in the army and might or might not really exist. If he’s a fiction of her imagination, then her being there makes sense, but maybe he’s not. As the movie goes on, Emory and the big boss, drucker have it out a few times. The first time comes when Emory sees drucker being interviewed on TV, taking credit for all of the ads. While Emory and the patients think this is terrible, that he is not giving credit to the people whose ideas they all were, it is also the way things are done in business. The boss is not exactly about to go on the air and announce to the world that his secret weapon is using patients at a mental hospital. What does Emory expect? the problem gets resolved when Drucker buys all of the patients cars. they drive them around the front yard of the institution, and it becomes very obvious during this scene, that the movie is really just dopey, escapist fun. if there was any truth or merit to it, some of these cars would be colliding. But of course that doesn’t happen, and it isn’t long before the patients have another problem with Drucker. The movie takes a strange turn in its final act. It suddenly becomes about the corruption of the institution. Members of the staff who support Emory and the patients are fired, and the doctor who is in charge of the place suddenly reveals a side of himself that appears to have come out of nowhere. At this point, the movie has become something that it wasn’t. It has taken a creative idea and turned it into the usual story of one man taking on a corrupt organization. This was a very good movie until it’s ending. Once villains started coming out, and behind the scenes deals started being made, this movie fell into a hole that it could have easily side-stepped and avoided. Even still, it’s a good movie with a lot of creativity behind it. The plot is definitely creative and fresh, and while one can certainly see how it was inspired by something like network, about a news anchorman suddenly telling the public the truth, setting that situation in the world of advertising is a great idea. Bringing it into a mental institution just builds on the potential. This movie is fun, but it does seem to lose its way by the end.